Ben Johnson was appointed to his position, Assistant to the President and Director of the White House Office on the President�s Initiative for One America, on February 5, 1999. Mr. Johnson oversees the first free-standing White House office in history to examine and focus on closing the opportunity gaps that exist for minorities in this country. He leads this new office to build on the foundation laid by the President�s Initiative on Race; promote the President�s goals of educating the American public about race; identify policies that can expand opportunity for minority and under-served communities; and coordinate the work of the White House and federal agencies to carry out the President�s vision of One America. Mr. Johnson joined the White House staff in 1993 as an Associate Director in the Office of Public Liaison and has served to build support for White House priorities and to facilitate advice and policy guidance for the Administration's initiatives. As Special Assistant to the President, he was responsible for all areas of outreach to the African American community. As Deputy Assistant to the President, his portfolio covered all areas of outreach to various constituencies, including senior citizens, Hispanics, Jewish, White Ethnics and members of the Disability Community. With a reputation for personal integrity and toughness, Mr. Johnson has been a tireless servant for the public good. His expertise spans over two decades of nationally recognized leadership and experience in management and public policy, as well as a long-standing commitment to opportunity and responsibility. In the late 1970�s, he was heavily involved in establishing community-based credit unions across the US with a national training program and served as Special Assistant to the Chairman of the Board of the National Credit Union Administration. Throughout the next decade, Mr. Johnson served in key positions, in both city and federal government. In the Carter Administration, he was Director of Consumer Programs and Special Assistant to noted advocate Esther Peterson. 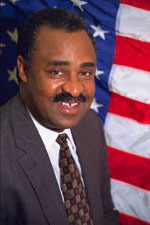 As Administrator of the Business Regulation Administration (1983-87), Mr. Johnson oversaw the governing of corporations that conducted business in the District of Columbia, the issuance of over 110 different business licenses and the enforcement of food protection laws and weights measure regulations. In 1988, he was appointed Administrator of the Housing and Environmental Administration and directed compliance to housing and environmental laws in the nation's capitol. Just prior to joining the White House in 1993, Mr. Johnson maintained District of Columbia�s Department of Public Assisted Housing as the Director with a budget over $200 million and supervised the procurement and contracting processes for maintaining over 11,500 properties. Mr. Johnson was raised in South Bend, Indiana, and has resided in Washington, DC for the past 22 years. He is the recipient of numerous awards, including an honorary doctorate degree for public service. Mr. Johnson is married to Jacqueline Johnson and is the father of four sons and one daughter. He is also an avid and able fisherman.